Weymouth and Portland will see the return of London 2012 Olympic 470 gold medallists Mat Belcher (AUS) and Jo Aleh and Polly Powrie (NZL) for the fourth regatta of the 2015 ISAF Sailing World Cup series. The Australian and Kiwis took gold in the Men's and Women's 470 in two memorable Medal Races at London 2012, finishing ahead of their British rivals - Luke Patience & Stu Bithell in the men's and Hannah Mills and Saskia Clark in the women's - who had to settle for silver. Three years on, the golden trio are back in action on Olympic waters joining up to 600 competitors across the ten Olympic and three Paralympic events for the next instalment of the ISAF Sailing World Cup series in Great Britain. Belcher won gold with Malcolm Page at London 2012 and has continued his golden form by taking a number of World Cup medals with Will Ryan (AUS), who he teamed up with towards the end of the Olympic year. The pair will be amongst the front runners for gold at the World Cup regatta and Belcher is pleased to be back, "I have great memories from Weymouth, particularly after the Medal Race, celebrating looking back up at the spectators on the Nothe. It was a great time in my life and to share that with my wife [Friederike Belcher (GER)] was very special as she was also competing. "I'm looking forward to seeing how Weymouth and Portland has changed over the time, revisit some old friends and just enjoy sailing on the Bay again." In the build up to London 2012 Belcher and Page claimed gold at the former 2012 Sail for Gold regatta which was part of the old World Cup series. Under the new World Cup model, which sees the world's top 40 sailors receive invitations through the ISAF World Sailing Rankings and qualification events, Weymouth and Portland features high calibre competitors spread across the Olympic and Paralympic fleets. 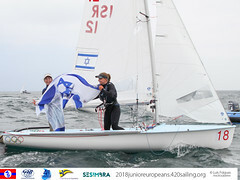 "Since the Sailing World Cup inception, we have been advocating this type of format, to race the best from day one," explained Belcher. "I'm happy that this concept has come into fruition. It's what the sailors want and definitely the direction we need to go to build the profile of the sailors and our sport." The new format came into play at the Hyéres World Cup in April and was an immediate hit amongst the competitors. Exceptional, close, tight and exhilarating were some of the buzz words around the boat park during and after Hyéres and they're expected to be heard once again throughout the week. Croatia's Sime Fantela and Igor Marenic took gold in the Men's 470 in Hyéres following a dominant performance. The duo sealed the deal with a day to spare and like Belcher, Fantela is an advocate for the format, "The new concept with 40 boats only is perfect for Igor and I. We love it," exclaimed Fantela. "The finals start from day one. There's no calculating, just top sailing from day one, exciting. "We take each race separately. We don't think we have an edge over the fleet, we just focus 100% on each day and try to sail by the plan we make. We will try to focus on our goals and give our best and that is all." The Men's 470 fleet is packed full of talented competitors for the Weymouth and Portland World Cup. Panagiotis Mantis and Pavlos Kagialis (GRE) recently took World #1 in the rankings and will be battling out at the front of the pack whilst the likes of London 2012 silver medallist Luke Patience, racing with Elliot Willis (GBR), Sofian Bouvet and Jeremie Mion (FRA), Stu McNay and Dave Hughes (USA) and Jordi Xammar and Joan Herp (ESP) all have the attributes to claim gold. Like Belcher, New Zealand's Jo Aleh and Polly Powrie also make a return to the 2012 Olympic venue for the first time since their victory over Hannah Mills and Saskia Clark (GBR). At London 2012 the battle between the Kiwis and the Brits was intense and it went down to a winner takes all final. The Kiwis kept their cool, claiming the race victory for gold and Powrie remembers her time in Weymouth and Portland fondly, "We obviously spent a lot of time there in the build-up to London 2012 and we have good memories of the place. We are looking forward to going back for the first time since the Games. "It's an enjoyable place to sail. It is lot like home for us, both on and off the water." Building up to the London 2012 Olympic Games the competitors spent weeks and months at a time, living, training and preparing in Weymouth and Portland. 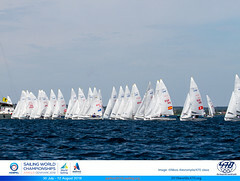 In-depth knowledge and know-how of any venue is vital for any sailing competition. Aleh and Powrie acquired a substantial amount of information for London 2012 and when asked if it was still in her head Powrie replied, "Not really. We will have to look back through our notes and refresh ourselves but I'm sure it will come back again once we are out on the water." Also like Belcher, the Kiwis won gold at the former 2012 Sail for Gold regatta and have revelled in the new format after they took silver in Hyéres. "It was great racing in Hyéres and it's been a really successful concept so far. It feels like the World Cup now has a bit of prestige associated with it as you have to qualify to sail. "It looks to have really boosted numbers in the qualifying events as well and provides a clear pathway for sailors wanting to compete." Joining the Kiwis in the Women's 470 fleet will be Lara Vadlau and Jolanta Ogar (AUT). At London 2012 Vadlau was just 18 years old and with Eva-Maria Schimak they finished 20th in the Women's 470. Flash forward to 2015 and she is recognised as one of the fiercest competitors. Together with Ogar the pair took 2014 European, World and World Cup gold and will be amongst the frontrunners at Sailing World Cup Weymouth and Portland. Great Britain's Mills and Clark will also be in the hunt for medals as will Sophie Weguelin and Eilidh McIntyre (GBR), Tina Mrak and Veronika Macarol (SLO) and Anne Haeger and Briana Provancha (USA). 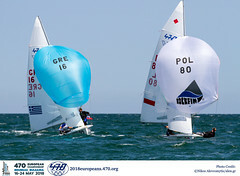 Racing across the ten Olympic and three Paralympic classes commences at 11:00 local time on Wednesday 10 June out of the Weymouth and Portland National Sailing Academy. Medal Races on Sunday 14 June will bring the regatta to a close. The @ISAFupdates and @SailingWC_GBR Twitter account will be following the action throughout the week. Get involved by using the #SailingWorldCup and #SWC2015 hashtags. Each course also has its own designated twitter page.